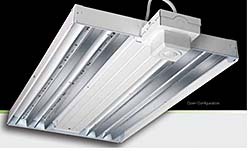 HB LED fixtures are designed for use in most common high bay applications. LEDs are available in color temperatures of either 4000K or 5000K with a minimum CRI of 80. Models are either 20-by-48-inches or 20-by-37-inches and are available with 0-10V dimming drivers, modular power supplies, door frame lenses, multiple lumen packages, multiple sensor options and aisle and wide distributions. Available with drivers for 120-277V applications. Can be either suspension or single monopoint mounted.